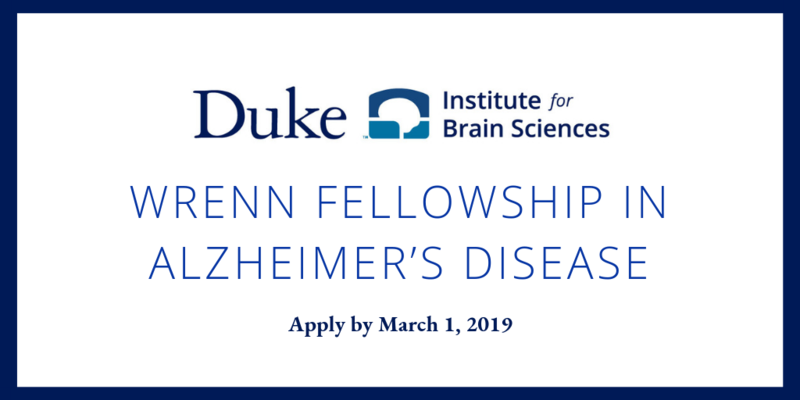 The Duke Institute for Brain Sciences invites Duke PhD students to apply for the Wrenn Fellowship in Alzheimer’s Disease. One three-year fellowship in the amount of $40,000 per year will be awarded. The fellowship is made possible through the generosity of the Wrenn Trust, named for Duke alumna Karen L. Wrenn, who died of Alzheimer’s Disease. This will be the second three-year Wrenn Fellowship awarded; the inaugural Wrenn Fellowship was awarded to Yixin Ma, PhD, in 2017. Applicants must be matriculated Duke PhD students who have completed their graduate coursework and are actively working on an innovative research program focused on the diagnosis, pathophysiology, or therapeutics of Alzheimer’s Disease. The awardee will be named a Wrenn Fellow and will be asked to provide an annual research report and to attend periodic meetings with the donor to provide updates. Questions about the award should be directed to Dr. Schramm-Sapyta, nicole.schrammsapyta@duke.edu.